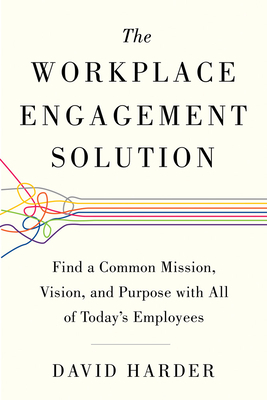 Organizations around the world spend billions of dollars every year to awaken and engage their employees. Yet global employee engagement remains fixed--at 13%. The disengagement problem usually begins with the CEO telling human resources to fix it. Unless the CEO or business owner takes charge of engagement, everyone will look over the messenger's shoulders to pick up cues from the top leader. Most workers can't engage because they are overwhelmed trying to keep up with change. This problem speaks to a much deeper need. We need to teach our workers how to change themselves. David Harder launched Inspired Work, a firm devoted to transforming our relationship towards work and building great environments in which to work, in 1990. More than 42,000 participants have used his program to change careers, become better leaders, and launch new or renewed businesses. His leadership program premiered at the Walt Disney Company in 2001 and is delivered to organizations throughout the world, organizations as diverse as HBO, the University of Southern California, Rio Tinto Minerals, Sony Pictures Entertainment, Loyola Marymount University, and others. Harder is a highly successful syndicated contributor to a wide variety of online platforms that reach over six million combined readers. He is a keynote speaker for Ultimate Software's human resources conferences throughout the United States. He lives and works at the beach in Pacific Palisades, California. "David Harder has done it again. His experience and passion for helping others shines through in the pages of this 'bible' for the New World of Work. He shares keys, advice to all who are open to learning and listening. Those who do will prosper and enjoy more of their life at work and in general."